DOHA, Qatar, Jan. 25, 2019 /PRNewswire/ -- Alfardan Group has ventured into Qatar's medical services sector with the launch of the Alfardan Medical with Northwestern Medicine. Alfardan Group unveiled the new project at a press conference held at Northwestern University, Qatar. The Alfardan Medical with Northwestern Medicine will offer patients a wide variety of ambulatory care services later this year – a first-of-its-kind in Qatar. This is the first of the Alfardan Group's investments in the health sector, as part of its social responsibility towards the State of Qatar and its vision to develop projects that will contribute to the realization of the Qatar National Vision. Mr. Omar Hussain Al Fardan, President & CEO of Alfardan Group, said: "The Alfardan Group has built its reputation on offering our clients a lifestyle in keeping with the quality, luxury, and premium services that they value. A sustained focus on meeting those needs and aspirations has seen the company reach tremendous heights of success in business." Al Fardan added: "With the opening of Alfardan Medical with Northwestern Medicine, our ambition is to enhance Qatar's medical system and reach global standards in healthcare. We are capable of delivering the most advanced integrated healthcare by leveraging our strengths in this venture, Northwestern Medicine, and their expertise in medical services, combined with the Alfardan Group's renowned capacity for service excellence. I am confident that these merits will truly differentiate Alfardan Medical with Northwestern Medicine as a premier healthcare provider." "Northwestern Medicine is committed to providing high-quality, compassionate care to patients that is informed by breakthrough research. 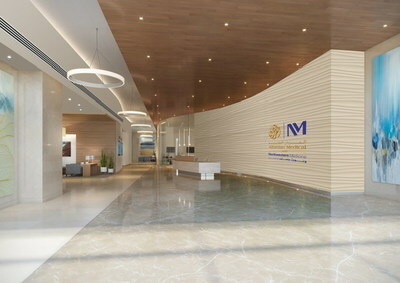 We are pleased to have the opportunity to assist Alfardan in its new project to bring world-class care to Qatar," said Dean M. Harrison, President and Chief Executive Officer, Northwestern Memorial HealthCare. "With this collaboration with the Alfardan Group, we have the unique opportunity to extend our Patients First mission to the Qatari people." Alfardan Medical with Northwestern Medicine will be located at the Burj Alfardan in Lusail, and will occupy 11,000 sqm over six dedicated floors. The clinic's medical staff and clinicians will be a specialized team of multinational professionals including many from the U.S. The new and valuable addition to private healthcare services in Qatar will also enhance Qatar's position in the field of medical tourism in the region. Alfardan Group's entry into the medical sector marks the opening of a new chapter in the Group's success as one of Qatar's pioneering business leaders for over 60 years, which has seen Alfardan Group grow to become one of the premier family-owned conglomerates for several business lines in the region.